The problem with a lot of our snazzy devices is that, although they hold a ton of music and will play it, they don’t sound all that good. You turn up the volume on your phone or your laptop and the sound gets tinny or distorted or just plain awful enough that you have to be hooked to your device with a pair of earbuds or it’s just not worth it. Brookstone’s new Big Blue Audio products provide an affordable solution to this problem with Big Blue Studio and its portable little sister Big Blue Live. 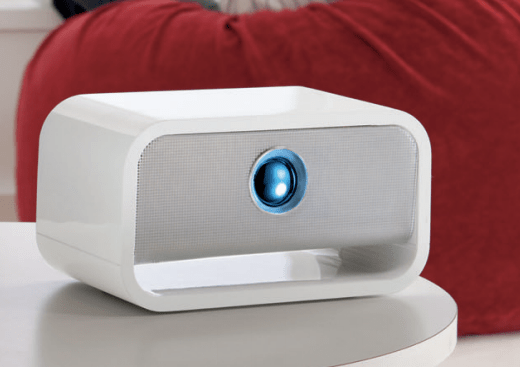 Big Blue Studio connects wirelessly with Bluetooth-enabled devices at a range of 33′ so you can listen to your favorite music without being tethered to a speaker. It’s very easy to get started and I had this speaker filling my living room with sound within minutes of opening the box. Open the box, plug it in, and then press and hold the front button to put it in pairing mode. A blue light blinks and you hear a series of beeps to let you know it’s working and then you can select the speaker from your device. That’s it. You control the volume with touch-sensitive buttons on the top of the unit and can adjust bass and treble via two knobs on the back of the speaker. Honestly, I didn’t think the bass and treble adjustment would do a lot, but they really did change the quality of the sound so that I could hear my music the way I wanted it to sound. And as for the sound itself, I was impressed. I’ve got a stereo surround sound system in my living room and I bounced back and forth between that and Big Blue to see how closely they matched up. I don’t know if I was happy or a little dismayed that the speaker gave my surround sound a run for its money. The sound didn’t distort at higher volumes (although it did wake up my kids, oops) and the bass was rich and strong thanks to an open-air down-firing subwoofer. The only time my stereo system really beat the Brookstone Big Blue speaker was when it came to surround-sound quality. Although it easily filled the room with great sound, it didn’t quite capture the fullness of a surround sound system. Speaker positioning in the room did change how noticeable this was, so it’s worth moving it around a bit before you settle on a permanent location. That said, this is one speaker, not a stereo system, and with Big Blue Studio coming in at an incredibly well-priced $149 it’s a great choice. If you’re looking for a portable version of the same speaker, then try Big Blue Live which is small enough to slip into a jacket pocket or backpack. The sound isn’t as full as the larger Big Blue Studio, but it’s still a powerful little speaker. There was no distortion at higher volumes and no tinniness to the sound. It loses the adjustable bass and treble, but it gains the ability to double as a speaker phone with a built-in mic. Particularly for travelers who want an easy-to-use, portable speaker or for having music on the deck this summer, this is a great option. It’s also got a great price point at $99. The Brookstone Big Blue Studio and Big Blue Live are both worthy entries in the Bluetooth speaker market with excellent sound quality and affordable pricing, and with Father’s Day just around the corner, these would make Dad a lot happier than a tie. ← The Lego Lemonade Stand… in Progress.